Ahead of the Game of Thrones final season, Random House Audio has for the first time released A Game of Thrones—Juego de tronos—as a Spanish-language audio book for the Latin American market. The rest of the series, as well as Fire and Blood (Fuego y sangre) will be released from now to September 2019. Juego de tronos has released today, and is available at a number of vendors—most notably Audible.com, which gives new members two free audio books when they sign up for a membership. Fans of George R.R. 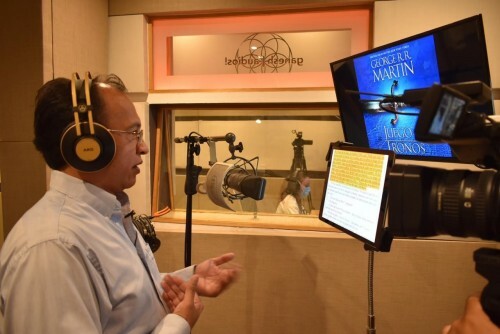 Martin’s epic fantasy series A Song of Ice and Fire will now be able to hear the audiobooks in a new language: Spanish. Penguin Random House Audio will release Spanish-language audiobooks of the bestselling series beginning this spring, just as the final season of the hit TV series premieres. Actor Víctor Manuel Espinoza, also known as the voice of Homer Simpson in Latin America, will narrate the complete series in Spanish, totaling more than 200 hours, starting with Juego de tronos, on sale April 9. Audiobooks are the fastest-growing area of book publishing, a trend driven in large part by the increased availability of titles on audio. Penguin Random House Audio is expanding its Spanish-language audiobook production, publishing Dan Brown’s Origen read by Germán Gijón and Lin Manuel Miranda’s ¡Buen día, buenos noches!, read by his father, Luis A. Miranda, Jr.
George R.R. Martin is the #1 New York Times bestselling author of many novels, including the acclaimed series A Song of Ice and Fire, which began in 1996 with A Game of Thrones and has since become a worldwide phenomenon, selling over 85 million copies worldwide in 47 languages.